There are six major abdominal muscles that provide postural support, trunk movement, and breath assistance. Running from deep to superficial, these are: transverse abdominus, internal obliques (right and left), external obliques (right and left), and rectus abdominus. When collectively engaged, they knit the abdominals toward the naval hugging the abdominal organs closer to the spine. The transverse abdominus is the deepest muscle of the anterior abdominal wall. It wraps from the lateral back body on each side around to the front mid-line. Many use the image of a corset that cinches the waistline. When accessing this muscle in the beginning, it is helpful to think about it in three parts: upper (at the base of the ribcage), middle (on both sides of the naval), and lower (at the top of the pelvis). Lie on your back with knees up and feet flat on the mat. Bring your hands to the bottom of your ribs. Inhale, feel the ribs expand into your hands, and then exhale, and consciously knit the base of the ribs toward each other. Move your hands to the middle part. Inhale, expand into your hands. Exhale, cinch the waistline sweeping your hands toward the naval. Bring hands to the top of the pelvis. Inhale, fill the belly. Exhale, narrow the top of the pelvis. Repeat. The internal obliques are the next layer up and fan out from the top of the ilia (pelvis) toward the naval. 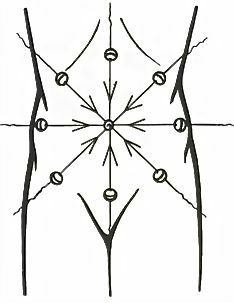 If you cross your arms over the front of your body and touch your ilia, this is basically the direction of the internal obliques. They, like the transverse abdominus, are important for posture. They are also involved in rotation and lateral flexion of the torso. The external obliques are the next layer up and fan out from the bottom of each side of the ribcage toward the naval. Imagine wearing a hoodie jacket with pockets, as you put your hands into your pockets, this is the direction of the muscle fibers which run opposite the direction of the internal obliques. These muscles are also involved in rotation and lateral flexion of the torso. The rectus abdominus is the most superficial of the abdominal muscles. It runs vertically along each side of the front mid-line from the bottom ribs down to the pubic bone. This is the muscle that is commonly referred to as ‘six-pack abs’. It is involved in flexion of the torso or lifting the head in supine. I am often asked about the role of the abdominals in breathing. The first thing to know is that the abdominals are considered secondary breathing muscles. They strongly engage for any forceful exhale. You have most likely felt them along with the pelvic floor in sneezing or coughing. We use them in yoga for uddiyana bandha and many of the fire breaths, like kapalabhati. But we are also encouraged to allow ourselves a nice full belly breath. What does that mean? As the breathing diaphragm drops down on the inhalation to allow more breath into the lungs, it displaces the belly organs down and out. It can only do this if the abdominal muscles relax. However, there are some poses that require strong abdominal engagement. So what happens to the belly breath then? A strong abdominal engagement inhibits belly breathing and requires one to find more movement of the breath in the ribcage. But there are also many poses in yoga, where you need some abdominal engagement for postural support and integrity, but not necessarily enough to limit the breath in the belly. This is a great opportunity to feel the fullness of the breath throughout the whole torso with just enough abdominal engagement to feel that the belly muscles are hugging around the breath, drawing it and the organs closer to the spine. Bonnie Cohen teaches that developmentally we develop flexor (front body) tone before extensor (back body) tone. This is one of the reasons putting babies on their bellies to play is so important. The nervous system is hard-wired through the tonic labyrinthine reflex to build postural tone along whatever surface is being supported. When we lie on our bellies, we build flexor tone. Young babies also do a lot of scrunching and bunching as they inch and wiggle around. This is a functional expression of the digestive rhythm initiated by the sucking and swallowing reflex. It prepares the flexor tone to support the lift of the head – an action of the spinal extensors. I cannot emphasize enough how important it is for us to practice and teach belly down backbends. Many of us have rounded shoulders and upper backs from the many things in our society that pull us forward. We can stretch the chest and open the front of the heart over and over again, but the real key is to strengthen the extensors of the upper back and the muscles that stabilize the shoulders. To do this safely, we need front body support. Come onto your belly, either flat on the ground or lying over a blanket or bolster. Begin by finding your baby-like scrunching and bunching. Reach the toes backward. Reach the tail back toward the heels (don’t tuck). Root the pubic bone into the mat. Feel the pelvic floor narrow and lift up. Engage the abdominals up and into the body. This is the support you need for backbending. Now let it go and repeat a few times. Staying in this position, bring your hands in line with your shoulders and the top of your head with the elbows wide and soft on the ground. Repeat the baseline engagement outlined above and add a slight yield and push of the hands, forearms and elbows into the ground. As you do this, knit the shoulder blades into the ribcage and float the chest and head a little bit off of the ground. This should center the head if it was turned. Keep the neck long. As you release, turn the head to the other side. Repeat a few times until eventually you are coming up as high as you can with your elbows resting wide on the floor. This is baby sphinx. After a few repetitions of baby sphinx, you can swing the elbows under the shoulders for sphinx. Once the elbows arrive, re-engage the reach of the tail and toes backward, the lift of the pelvic floor and the abdominals headwards, and press the full length of the forearms into the ground. Stay long through the back of the neck looking just past your fingers. Enjoy the spacious supported reach and then let it go. For your finale, keep everything engaged and press up into a cobra, crown of the head reaching straight up to the sky, belly lifted into the back body. Then release it all the way down and rest.